We have timed a number of adventure races over the last year as it is a good fundraiser for the O club. The Sportident timing gear is ideal for recording split times through the sections of a race and making sure competitors visited all check-in points. 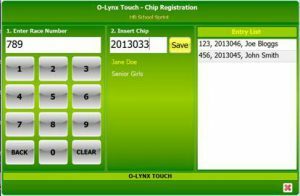 One of the things that has helped a lot is the new “Chip Registration” screen in O-Lynx Touch. For a number of years we have handed out the Sportident chips at registration the night before the race, but after losing quite a few chips last year, this needed to change. people pick up their race pack the night before but for various reasons don’t turn up on the day. people turn up to the race but leave their race pack at home with their bibs and chips. people in teams, but each leg runner turns up separately and wants a chip, swearing they are the person allocated to get the chip ( 1 chip is used per team ). This means a team can get issued with multiple chips. So this year, things were changed and the chips were handed out on the morning of the race, though this initially made the organisers nervous about the time needed to issue them. 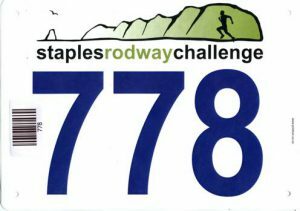 To make it work successfully, a barcode was printed and stuck on the bibs before they were put in the race packs. These barcodes could also be preprinted as part of the bib. Getting the entry information into O-Lynx is done via a CSV file imported from the organiser’s web entry system. The file usually requires a bit of massaging setting up the grades and categories but I often use a custom program or excel spreadsheet to do this. When the file is imported, rather than set a real chip number for each entry, the value in O-Lynx was just set to the race bib number. E.g. bib 300 = chip 300. 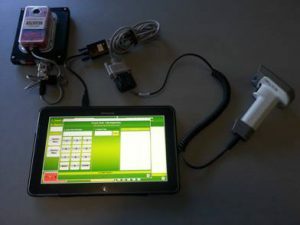 On race day, we set up table with O-Lynx touch and a barcode scanner. The chip registration screen in O-Lynx Touch has just 2 input boxes on it. As you can see, it allows manual entry of the bib number ( and SI number ) as an option, but the barcode scanner will fill out the bib number box when the barcode on the bib is scanned. It also shows the runners name and course for confirmation. Then a chip is picked up and inserted into the SI station. The punch triggers O-Lynx Touch to save the chip number against the bib number. There is no need to look for a specific chip, just grab the next one from the pile. We issued about 400 entries in 15 minutes, so it worked extremely well. At some events I also had a second tablet to deal with late entries or other changes that cropped up. Another plus is that in past years we also had to have check stations as the runners made their way to the start so we could be certain of who had started, but the registration process made this easy. Non-starters stood out in the entry screen as those still with a short 3 digit chip number who hadn’t collected their chip.